“Do you have Whatsapp?” Surely someone has asked you that dozens of times and we bet your answer was yes. And that’s why the popularity of this app has been increasing, since its appearance in 2009. That’s why today we want to talk about an increasingly common practice among businesses: The Whatsapp Marketing. In this post, you will find information and statistics that will help you understand the importance of Whatsapp as a means of communication to reach your audience. Along with this, you will find ideas and tips to take advantage of this tool to the maximum and to do Whatsapp Marketing successfully. Let’s begin! As we said above, Whatsapp was created in 2009 by Jan Koum and Brian Acton, two former Yahoo employees. Since then the use of this application has continued to spread, especially among the countries of the West, to register in the year 2017 more than 1200 million users. For this great massiveness, the reach Whatsapp gives you as a marketing tool is excellent: Among its users include people of all ages, profiles and socioeconomic situations. This means that most people who make up your target audience use this application. The Whatsapp service is currently used in 109 countries. 70% of Whatsapp users use the app on a daily basis. Each day 100 million voice calls and 55 million video calls are made. 175 million people actively use the Whatsapp Status function. The application is available in 53 languages. 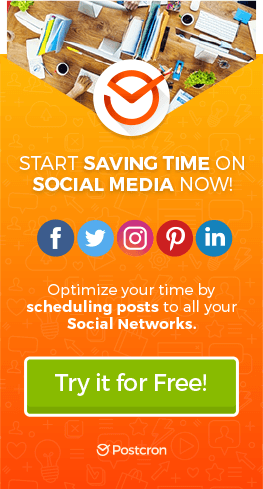 Let’s see now how it can help your business. 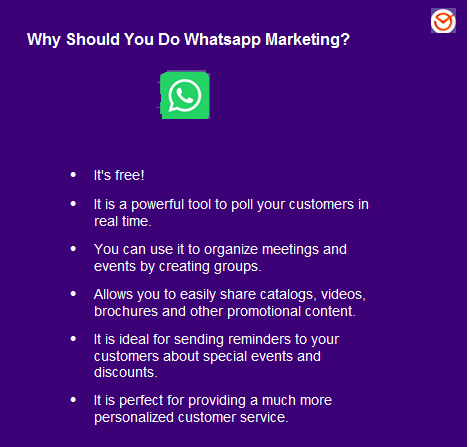 Why should you turn to Whatsapp Marketing? There are numerous reasons why we recommend implementing WhatsApp as part of your marketing tools. For starters, this is a free application, whose use is so widespread that probably contains among its users your target audience. But there is more: Because of its features, Whatsapp gives you the possibilities to communicate with your customers directly and in real time. This is a huge advantage when it comes to getting to know your audience’s opinions (e.g. through surveys) and providing personalized attention. Along with this, it is a powerful tool to spread your proposals, promotions, and news. Its wide support for multimedia content allows you to send catalogs, brochures, videos, audios, links and all kinds of information related to your business, which comes directly into the hands of your client. 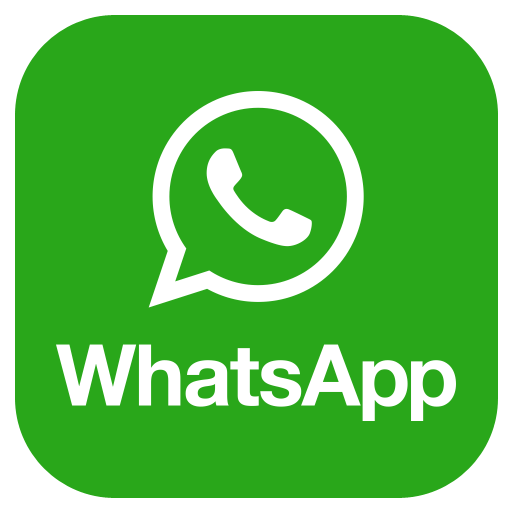 WhatsApp enables you to create groups of up to 256 members, which is an ideal opportunity to carry out direct consultations and focus group studies. They are also a perfect tool for organizing events with your customers and with your company employees (internal marketing). Finally, qualities such as immediacy and precision in terms of reach make this app the perfect way to send reminders and promote your special offers. However, it is important to note that a fundamental requirement to take advantage of Whatsapp Marketing is to have the telephone numbers of the people who constitute your target audience. To learn how to obtain such information, we recommend you read our article How to Create a Customer Database. 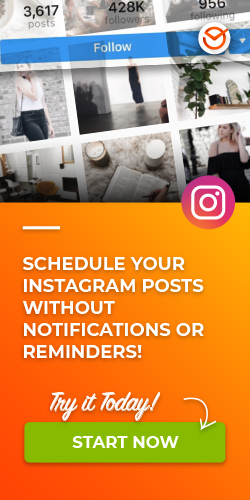 Besides that, there are other ways to take advantage of this app to promote your business and increase your conversions. This is demonstrated by numerous companies around the world, who clearly see the potential of this tool to increase sales. One of them is the brand of Vodka Absolut, you check the huge introduction of Whatsapp in Argentina (84% among mobile users) Decided to take advantage of the application to celebrate the special edition of one of its products, by launching an exclusive event. In order to attend Absolut’s party, people had to try to convince Steve (a character created by the brand) to include them on the guest list. They had to send photos, text messages, audios and all kinds of content as creative as possible, via WhatsApp chat. The result was a total success. Another great example of Whatsapp Marketing is the case of the Toyota Company, which in 2012 had the brilliant idea to take advantage of one of the functions of Whatsapp to promote their proposal through a contest. 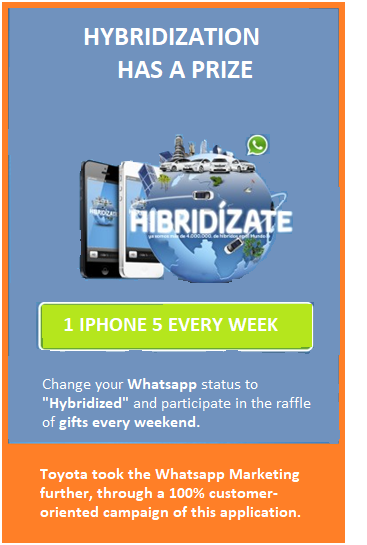 To participate, people should have put the word “Hybridized” in their Whatsapp Status. So, every week from October 25 until November 28 of that year, an iPhone 5 was raffled among users who registered on the website of the company and met the slogan. As a result, Toyota was in the mouth of thousands of users and managed to interest entire segments of its audience for weeks. 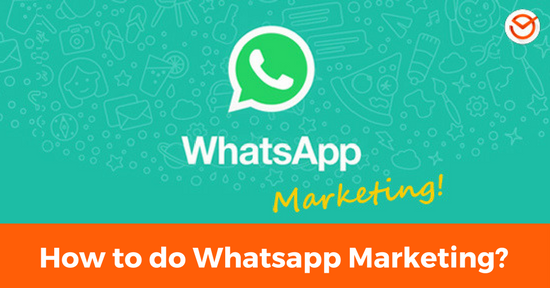 Now that you know the potential of Whatsapp as a marketing tool, let’s look at some tips on how you can make the most of it to benefit your business. Whether through chat, voice calls or video calls, WhatsApp offers you the opportunity to assist your customers and resolve their doubts in real time. Through this strategy, you not only manage to improve the quality of your service but also allow you to be loyal to your audience through a direct and personalized treatment. In this regard, we recommend you take advantage of Whatsapp Web to optimize your communications. It is about the desktop version of the application, which enables you to use the keyboard, microphone and PC camera, which is much more comfortable and productive. 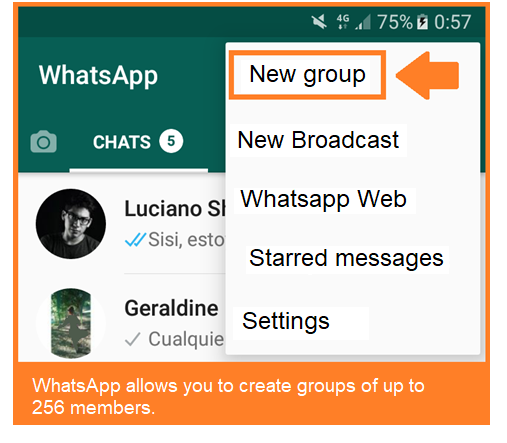 As we said above, Whatsapp enables you to create groups of up to 256 members. Through this function, you can generate a “collective chat”, in which all the members can interact. So, an ideal space is opened to survey specific audiences and obtain first-hand information for your market studies. Consequently, they are ideal to know the public’s opinion about the launch of new products. Alongside this, Whatsapp groups are extremely useful for organizing sales events and sharing information with clients with specific profiles (e.g. with specific needs or interests). To attract and keep the attention of your audience, it is essential that you use all the resources Whatsapp puts into your hands. So, when writing text messages, we recommend using italics and bold as a way to highlight the information. For bold, you must place the phrase between asterisks, like this: * Hello *. It is also very useful to enrich your messages with videos, GIFs, photographs, and links. Finally, do not forget to add emojis to increase the expressiveness of your shipments. Besides it is very advisable to send a single message with many paragraphs, instead of sending several separate sentences, since the reception of these is usually very annoying (be aware that each of your messages sends a notification on the mobile of your customers, And you do not want to disturb them or be spammer or invasive). To make a successful Whatsapp Marketing you better take full advantage of all the features that the app offers you. First of all, we recommend you to place a representative profile picture of your business. In this regard, an attractive and cordial representative logo or photos of the representative in charge are good choices. When sharing addresses (e.g. where a certain branch of your business is located, or where an event will take place) we advise you to implement the “Send exact location” function, whereby your client receives an interactive map with the clearly marked address and with all the facilities of Google Maps. 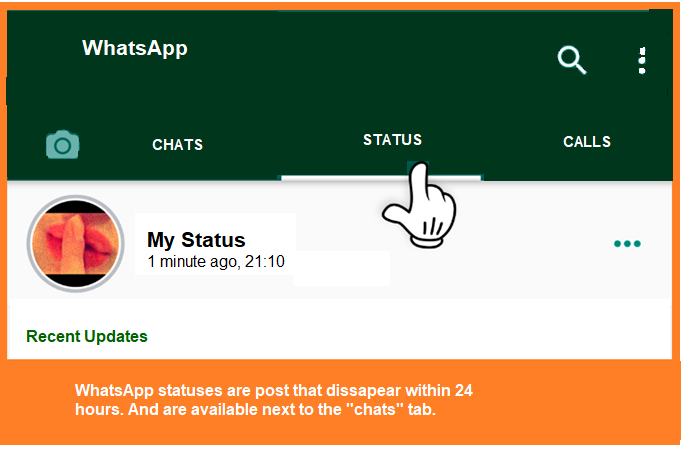 Finally, to promote your offers without being invasive (that is, without people receiving a notification), you can use the Whatsapp Status. This is a tab to upload posts that last 24 hours. And they disappear. The app notifies users that there is a new status by placing a circle next to the name of that tab. By way of conclusion, we can say that Whatsapp is an ideal tool to reach your audience, promote your brand and/or products, and communicate with the public in real time. Implement our tips to boost your business through this application! Then you tell us. That’s all for today! We hope that this blog post has helped you to measure the power of Whatsapp Marketing and start taking advantage of it to benefit your projects. Please do not forget to share this article with your friends and leave us your comments and opinions. Until next time!